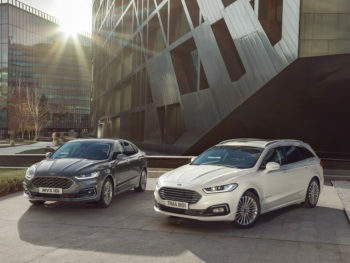 Ford has revealed its updated Mondeo range, which introduces new styling and its latest diesel tech while also debuting a hybrid estate version. Starting deliveries from the spring, the facelifted range now sees Ford’s latest 2.0-litre EcoBlue diesel introduced to Mondeo for the first time. Compliant with Euro 6d Temp emissions standard and using SCR emissions aftertreatment, the unit has been designed to deliver larger engine performance with smaller engine emissions. It’ll be offered in two variants; a 150hp version delivering from an anticipated 127g/km (NEDC Correlated) CO2 emissions and a 190hp expected to bring 133g/km. The new Mondeo also gets a hybrid estate model to join the existing saloon version. The 187hp hybrid powertrain combines a specially-developed 2.0-litre Atkinson cycle petrol engine, electric motor, generator, 1.4kWh lithium-ion battery and an automatic gearbox designed to feel like a CVT. Expected to account for up to 50% of sales, the powertrain uses regenerative braking technology to capture up to 90% of the energy normally lost during braking to replenish the battery, contributing to anticipated CO2 emissions from a targeted 98g/km for the existing hybrid four-door, and 103g/km for the new estate. Boot space for the hybrid estate does drop from 500 litres to 403 (with the rear seats in place) and 1,605 to 1,508 (with the seats folded) due to the position of the battery. Ford’s 165hp 1.5-litre EcoBoost petrol engine remains available, delivering from 150g/km CO2. Other changes see the introduction of Ford’s new eight-speed automatic transmission on the diesels. This has been engineered to further optimise fuel efficiency and deliver responsive performance and smooth, swift gearshifts. A six-speed manual transmission is also offered, and 2.0-litre EcoBlue Mondeo models can be equipped with Ford’s Intelligent All-Wheel Drive technology. 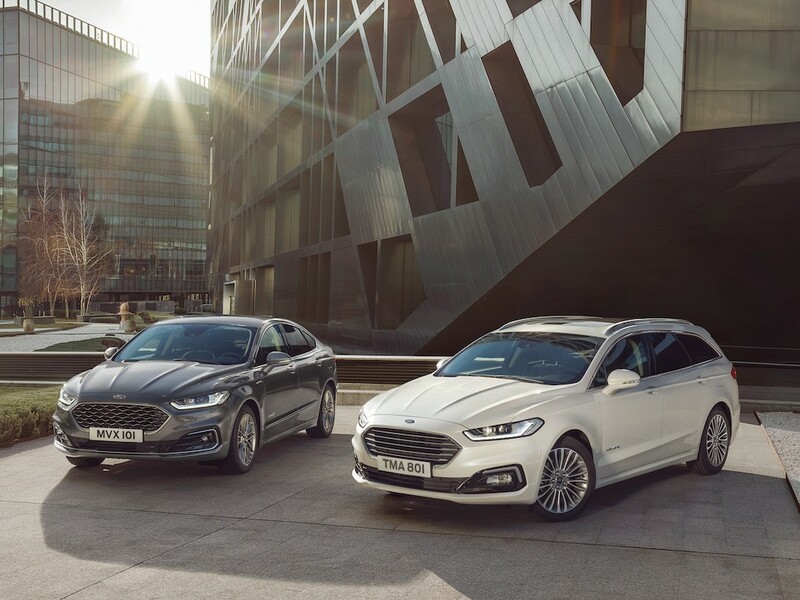 The Mondeo now also offers Adaptive Cruise Control technology – which enables the vehicle to automatically maintain a comfortable driving distance from vehicles ahead – enhanced with additional Stop & Go functionality. And Intelligent Speed Limiter also debuts on the new model. This combines Ford’s Speed Limiter and Traffic Sign Recognition technologies, and can help ensure the vehicle’s maximum speed is automatically adjusted to remain within changing speed limits.